Momentum around digital news video picked up in 2013. And, while no firms break out digital video advertising revenue specifically for news, the category of digital advertising as a whole is up sharply, growing 44% from 2012 to 2013, to an estimated $4.15 billion, according to eMarketer. Technological improvements lowering the barrier to entry, both for the audience and those in the news business, have spurred a wave of new entrants into the digital news video space. With 36% of U.S. adults recording videos on their cellphones, citizens are playing a valuable role in the news process, sharing videos of eyewitness moments around news events small and large. And both digital news outlets like Vice Media as well as legacy outlets like NBC took steps to develop approaches to digital video content in 2013. But a closer look suggests that digital news video does not necessarily have a clear or simple path to becoming a major form of news in the future. Producing high-quality video – or even streaming it live – can be costly, and the payoff is not clear. Video advertising, while on the rise, amounts to just 10% of all digital ad revenue and just 2% of total ad revenue. Large distributors of video content like YouTube already account for a large portion of video watching on the web, and a hefty share of the revenue. And for traditional legacy providers – local TV stations and national networks – most of their audience and revenue are still in the legacy platforms, which may reduce these companies’ desire to invest in digital video in a big way. Non-digital news revenue on local and national broadcasts, as well as cable, now amounts to $16 billion a year. On the consumer side, while television viewing has been the most popular form of news consumption for decades, it is still not clear how much that will translate to high levels of video-based news online. The growth rate has slowed considerably since 2007 (the year after YouTube was purchased by Google and the year the iPhone was released). From 2007 to 2009 the percentage of adults watching online news video increased 27%, but the next four years (2009 to 2013) saw just 9% growth. It is true that mobile devices are accounting for a larger share of video viewing, which could bring another spike in growth, but at the moment that increase remains only a hypothetical. This report examines the state of digital video – from the audience, to the revenue, to developments in content creation from both citizens and news organizations. It includes original survey data and a new audit of 32 local television news sites, as well as aggregation and analysis of a host of outside data. 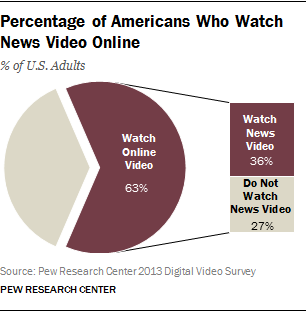 Over all, it finds that online video is clearly becoming a part of the news media landscape. News is a part of what people watch online, and, more than ever, the public is a part of creating this news. But online video is also very much still in development, and the revenue opportunities, while they exist, are complicated. Some who have moved most powerfully into this space are digital natives, not tethered to legacy platforms that still account for a good portion of their audience and revenue. The young are the heaviest consumers of online videos and are also strong consumers of digital news videos. Nine in ten 18-to-29-year-olds watch online videos, and almost half, 48%, watch online news videos. That is equal to the 49% of 30-to-49-year-olds who watch online news video and outpaces the 27% of 50-to-64-year-olds and 11% of those 65 and older who do the same. User-generated video content can play a critical role around breaking news, although a fairly small segment of Americans produce and share those videos. Pew Research Center survey data finds that 12% of social media users have posted their own videos of news events on social networking sites.2 Further, 11% of online news consumers have submitted their own content (including videos, photos, articles or opinion pieces) to news organizations or blogs. Factoring in those who are not online news consumers or social media users, this translates to 7% of U.S. adults posting their own news videos to social media and 7% submitting content to news sites. For now, the digital video market is small – about $4 billion, a tiny fraction of the broader digital ad market. And of that $4 billion, Google – through YouTube – accounts for nearly a quarter. And Facebook, which quickly jumped to the top in display ad revenue, just entered the digital video market in early 2014. That leaves a narrow space for news publishers to compete with other digital video services, such as Hulu and ESPN. The last year saw some major investments in digital news production. Vice Media’s launch of a digital news channel in early 2014, NBC’s acquisition of Stringwire in 2013 and HuffPost Live’s overseas expansion point in the same direction: News organizations are becoming more aggressive about video on the internet (though there have been stumbles along the way). Local TV news outlets are moving into digital video, but at varying rates. A Pew Research audit of 32 local TV news websites finds that all but four offer video on their homepages, but the amounts range from 92% of all homepage stories to just 6%. Roughly half, 14 of the 32, offer live streaming of their broadcast programs. In addition, 24 of the 32 have mobile apps with video watching capabilities in both the Android and Apple stores, and 18 have YouTube channels, though, again, the activity level there varied greatly.